Many children like to spend their time in our saloon, reading comics, playing society games or making jig-saw puzzles. 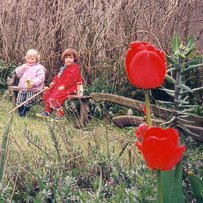 In our garden there are no slides nor swings, but kids always find something to play with. The garden is completely enclosed so children can play in all safety en during summertime they are allowed to eat from the red current and raspberries. Of coarse you can go walking with the kids, to the Fondry des Chiens or the castle ruins of Dourbes. 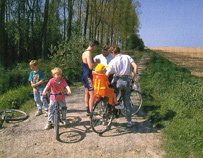 You can go cycling on the flat car-free Ravel -route to the river Meuse, or for the more experienced ones with a mountainbike through the forest. Such bikes are for rent and maps of the indicated walking and cycling routes are for sale at La Calestienne. 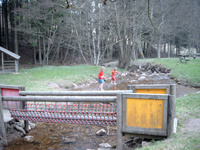 In Oignies, thirteen kilometers from La Calestienne, there is a nice and well-kept playground, arranged on the banks of a small rivulet. If you are thursty I would advise you the Café-épicerie in Le Mesnil, the next village. According to me, the caves Grottes de Neptune, on 3 km from La Calestienne, are quite damaged and relatively expensive, but for children who never saw a cave this is a beautifull introduction to speleology. At the Lacs de l'Eau d'Heure, some 15 km from La Calestienne, you find the children's playground of Falemprise, with a minigolf, watercycles and a café-restaurant. Nearby (Cerfontaine) there is a tropical swimming pool.